Insect Art: Ladybugs in Your House? Q. Why do ladybugs come into my house in the winter time? Q. Once the ladybugs are in my house, will they eat anything? A. No. 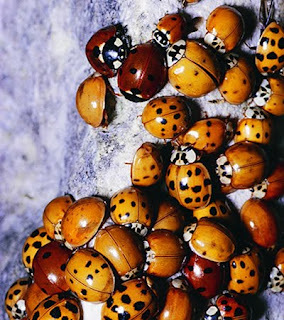 Ladybugs don't eat fabric, plants, paper or any other household items. They like to eat APHIDS. Aphids are very small, but very destructive pest that feed on plants. (If you have rose bushes, you have probably seen aphids.) Ladybugs, while trying to hibernate in your house, live off of their own body fats. They also prefer a little humidity, but our homes are usually not very humid during the winter. In fact, they are rather dry causing most of your ladybug guests to die from dehydration. Occasionally, you might witness a ladybug in your bathroom getting a drink of water. Now, that's a smart lady! Q. How can I get them out of my house? A. If you don't have a lot, just leave them. They will leave when spring arrives. Disturbing them will only cause them to stress out leaving yellow markings on your walls. The yellow stuff is not waste matter, but rather, their blood. Ladybugs release a small amount of their blood which is yellow and smells, when they sense danger. Some people have said that it does stain on light colored surfaces. Q. But, I really want the ladybugs out of my house! Q. Is there anything else I can use to get the ladybugs out of my house? Hey, thank you! A year back, our house was absolutely INVADED by ladybugs--weird, because it wasn't even cold! And we had no idea what to do, or how to get them back outside, where it was better for them. We have no aphids! Now I know--vacuum cleaner! At winter time, it's common to see lady bugs in your house. There are a lot of things you can do to eliminate them. Like what you've said, you can use vacuum.